Laid down, 9 March 1945, as MV Coastal Guide, a Maritime Commission type (C1-M-AV1) hull, under Maritime Commission contract (MC hull 2172), at Leatham D. Smith Shipbuilding Co., Sturgeon Bay, WI. Placed out of service, 27 March 1959, at New Orleans, LA. Transferred to the Maritime Administration for lay up in the National Defense Reserve Fleet, Mobile, AL. 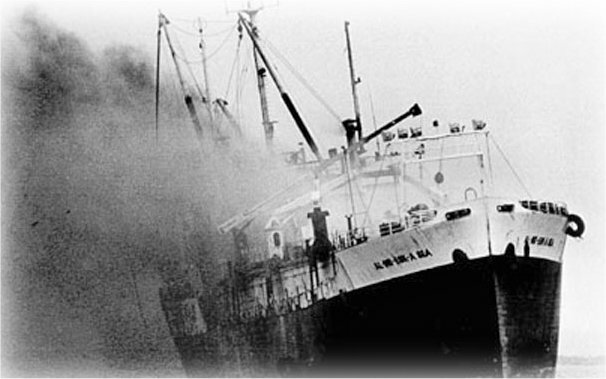 Sold in 1979, TransAlaska Fisheries Corp (a subsidiary of 13th Regional Corporation), renamed MV Al-Ind-Esk-A-Sea, and converted into a fish processor. Final Disposition, destroyed by fire 20 October 1982 while undergoing repairs in Port Gardner (Everett, WA). and burned for two days, rolling over and sinking at 10:14am 22 October 182 in 240 ft of water. Staff Sergeant George Peterson, a native of Brooklyn, N.Y., was killed in action while serving as an acting platoon sergeant with Company K, 18th Infantry, 1st Infantry Division near Eisern, Germany. On 30 March 1945, his company encountered intense small arms, machine gun, and mortar fire from an enemy battalion; and his platoon was ordered to flank the enemy positions while other units attacked from the front. Soon after moving out, Sergeant Peterson was severely wounded in the legs by mortar shell shrapnel, but he refused to turn back and continued to lead the platoon forward. Enemy machine guns then opened up on the unit. Sergeant Peterson crawled toward the guns and after working his way to a shallow draw, raised himself up and tossed a hand grenade into the nearest enemy position. He then became sole target of the second enemy machine gun; but, calmly and deliberately, he remained where he was and threw another grenade into that position. Both guns were silenced; and he continued on, becoming the target of an enemy rifleman who wounded him in the arm. Despite his wounds, Sergeant Peterson pressed forward for another 20 yards. Then, a third enemy machine gun took him under fire. He raised himself to his knees and fired a grenade from his rifle. The gun was silenced. After securing his objective, Sergeant Peterson submitted to medical aid. As he was being treated, however, a mortar burst seriously wounded one of his outpost men. Sergeant Peterson pulled himself from the aid man and began to crawl to the assistance of the wounded man. Just before he reached the man, Sergeant Peterson was struck and killed by an enemy bullet. 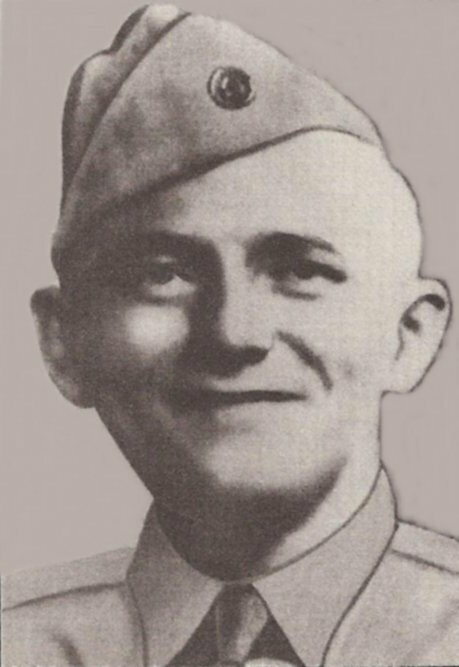 For his actions, which enabled his company to advance with minimum casualties, Sergeant Peterson was posthumously awarded the Medal of Honor.